I made this last year actually. Not that long really, it was made last year December. So, that's like 4 months back. I made this in conjunction with dad's 50th birthday. Yeappie, dad finally reached the big 5-0. I don't think he has any problem accepting it. When you hear honey cake, the first thing that would cross anyone's mind would be dry and tough. Only Nigella can come up with a honey cake, so soft yet so moist. Chocolate flavour wasn't too subtle too. Very cute bees aren't they? With bodies made from marzipan and wings made from almond flakes, it was no surprise that the two kids wouldn't sleep and kept bee-ing around as if they were playing with paper aeroplane with the sweet pastry the whole night! Yeap, I sent them a generous slice of this cake each. Not my kids, just a friend's kids! 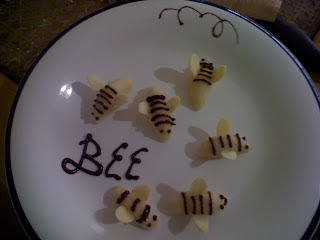 Instead of using a toothpick to draw lines on the bees like what Nigella did, I chose to pipe them on with the leftover ganache from the cake frosting. 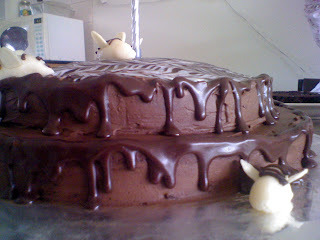 Overall, the cake wasn't too sweet and the frosting complimented it really well. Notice the colour difference between the top and bottom layer. I said it was Nigella's honey chocolate cake, not chocolate cakes. 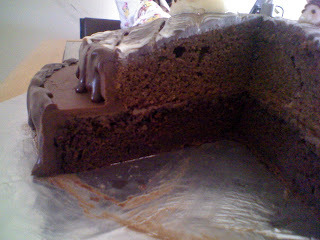 The top layer was a steamed chocolate cake which is a perrenial favourite among me and my loved ones. Maybe you should give this a go and whip the honey chocolate cake. No regrets, it was undoubtedly the best honey cake I've ever tried. It totally changed my perspective on honey cake. I don't see honey cake the same way anymore now. p/s: A copy of the recipe available here and a video of it by the Domestic Goddess herself here. 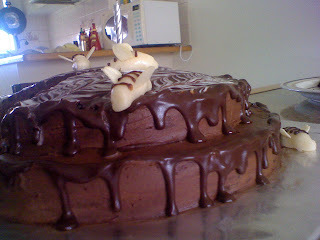 6 comments on "Nigella's Chocolate Honey Bee Cake"
Thanks for the compliment Ellena! 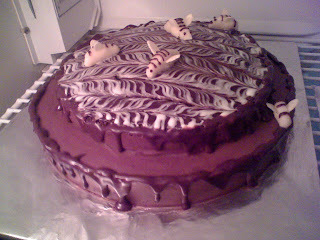 I made the cake in the very first place because I love to honey bees. They look so disney like and so adorable with the little eyes. Do try make it for Reyon. Hi, this is a pretty cake and I think it is nice to eat it too. Hell yeah, that chocolate honey cake was very delicious. I really don't like honey but I love the cake so I guess that's kinda self-explanatory!